If you need help with the washing, rinsing and wiping of the windows in your home, office, hotel or other type of property use our services. Our company offers excellent window cleaning at affordable rates in Kilburn which will save you time and money. 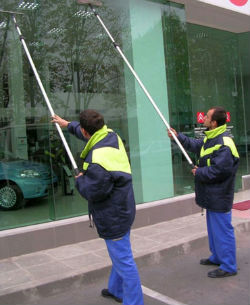 You can rely on our staff to ensure the spotless and presentable state of your windows. We can make them washed of the dust, stains and grime, rid of streaks and clean on the inside and outside. Use our call centre or booking form to schedule the sanitising of your windows. We guarantee you excellent results. Our services can be used in residential properties by their homeowners. We can ensure the clearly visible and spotless state of your windows by using telescopic poles that are constantly supplied with purified water and reach to the 3rd – 4th floor. Our staff use ladders to get to higher external windows and ensure effective cleaning of the glasses, frames and ledges. They can clean all kinds of windows in domestic estates, located in Kilburn which can be done upon request and regularly. We can safely reach to all your windows to wash and clean them. Use our professional services to maintain the windows in your home in good condition. Stains, dust, debris, bird droppings can make the external glasses and ledges dirty. The best way to keep your windows clean is using our effective services. Our company provides the necessary carbon fibre telescopic poles, purified water and ladders for the cleaning. Our staff are experienced in removing stains and grime from the glasses, wood and plastic ledges. They can carry out flawless window cleaning in Kilburn with excellent results. Use our services to keep your windows washed and clearly visible at all times.